Finally, I have the opportunity to finish detailing our trip to Canada. 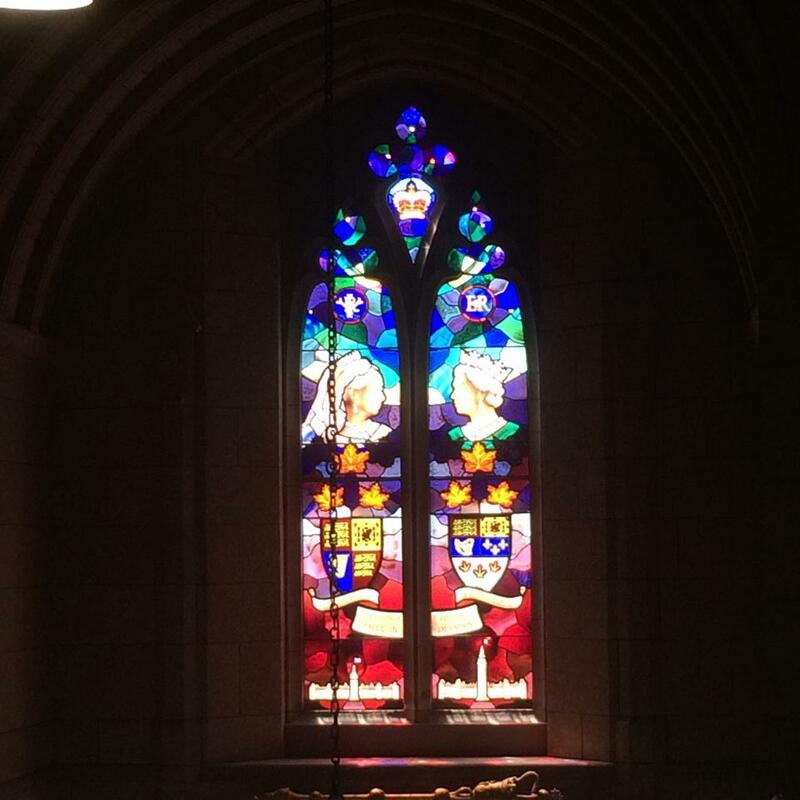 In previous posts, I chronicled our adventures in Quebec City and Montreal. The final leg of our excursion includes Ottawa, Toronto and Niagara Falls. After attending the Montreal International Jazz Festival, my friend Donald and I headed west to Ottawa. We arrived late in the evening at Gatineau, a suburb of Ottawa located in the province of Quebec. We checked in to our hotel, Crowne Plaza Gatineau, but we were so tired that we experienced nothing outside of our beds and the shower. Both were fine and typical of a 3 star hotel, and a pretty decent value ($124 with all taxes and fees). 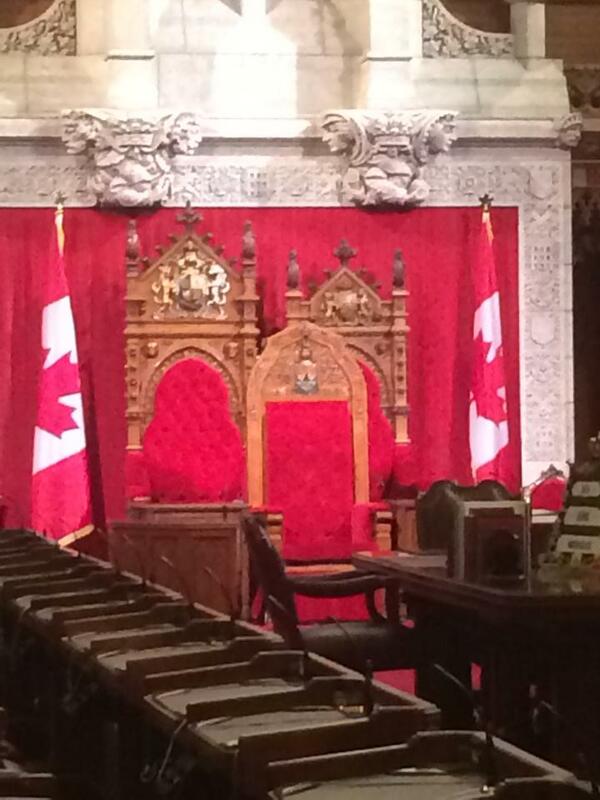 The next morning, we headed to the Canadian Parliament to embark on our private tour. Thanks to my friend Soren, we got the VIP treatment from a communications staffer for Prime Minister Stephen Harper’s office. Vivek was fantastic and shared with us the fascinating history of the building, and even better, we compared and contrasted our jobs — mine as a Congressional communications staffer and his as a staffer for the Prime Minister. He was patient as I asked far too many questions, and even showed us the Prime Minister’s office. It’s an experience I won’t soon forget! Donald and I especially enjoyed watching the changing of the guard, as well as the preparations for the next day’s celebration of Canada Day. 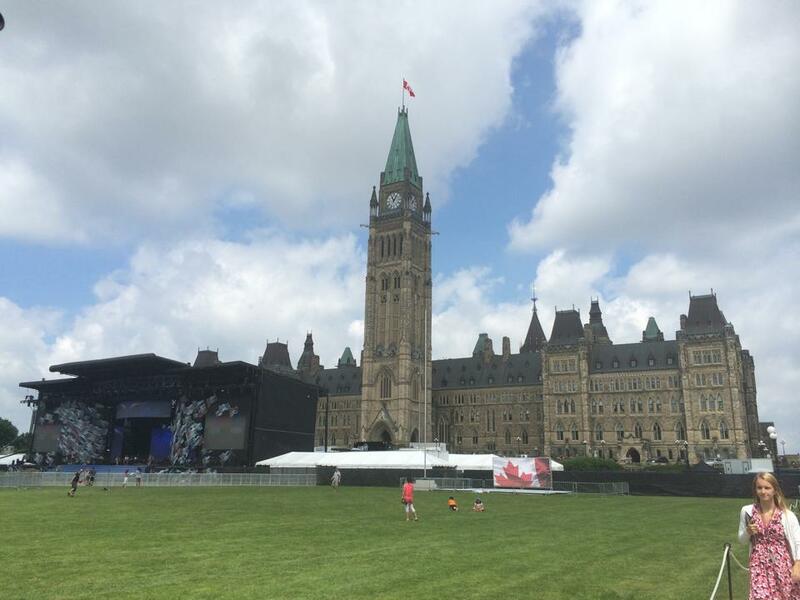 Getting ready for Canada Day outside of Parliament in Ottawa. 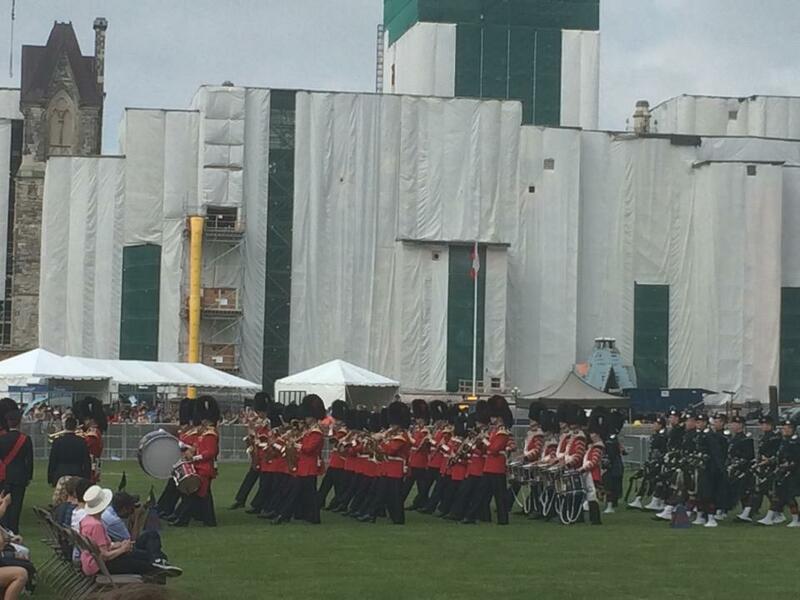 Changing of the guard in Ottawa. Unfortunately, our time in Ottawa was brief, as we had plans that evening in Toronto and a four hour drive ahead of us. I must admit that driving into the city of Toronto was a bit intimidating. I’ve often driven through some congested cities – Atlanta (the worst, by far), Houston (a close second), Dallas (tied for second), Washington, D.C., New York City (Times Square, even) and my own hometown of Baton Rouge (which must have been planned by drunks, which wouldn’t surprise me anyhow). But, driving into Toronto was an utterly horrifying experience for me — cars zoomed by and switched lanes while I tried to split my attention between exit signs and the GPS mounted to my windshield. I was relieved when we arrived at our hotel — Novotel Toronto Centre. Sadly, of all the places we stayed in Canada, it was by far the worst. The room was scorching hot, and more miserably, humid. There was little insulation, so we could hear people rolling suitcases down the hall and conversations (in inside voices) bounce of the walls in the hallway. Then, it got worse. I decided to take a nap before hitting the gym (which, besides this hotel’s central location, was its only redeeming quality). Unfortunately, beneath the thin comforter, there was only a single sheet — and it wasn’t covering the mattress. According to the hotel staff (who contacted me a few weeks later after Donald complained on social media, more on that in a bit), this was European style bedding. After a miserable 45 minutes of unrest masquerading as nap, I hit the hotel gym, which was the best part of my stay. During this time, Donald, as he is known to do, hit the hot tub. While I felt rejuvenated after my workout, Donald returned to the room complaining that the hot tub was not working properly and that he had to get up every five minutes to restart it. Those who know Donald know he likes his relaxation time, so he was a bit frustrated. Thankfully, the Novotel was out of mind when we headed to the CN Tower for dinner. First, we decided to have a beer at a bar called the Titled Kilt. I foolishly assumed it was your run-of-the-mill of Irish bar, but I was sadly mistaken. Instead, it was an “Irish” (and if by Irish, you mean Tempe, Arizona-based) version of Hooters — a McHooters, if you will (and you will). I quickly gulped down my beer as the scantily dressed barkeep (she’s someone’s daughter you know) flirted with the 22-year-old American who’s just in town for business (whatever business 22-year-olds do, that is). I did not, in fact, purchase a calendar of their “lovely girls,” so don’t ask if you can borrow it. Then, we Ubered (by the way, they have Uber in Montreal and Toronto, which was a total God-send) to the CN Tower for our 9:15 p.m. reservation at 360 Restaurant, the high-end eatery that rotates atop the space needle. 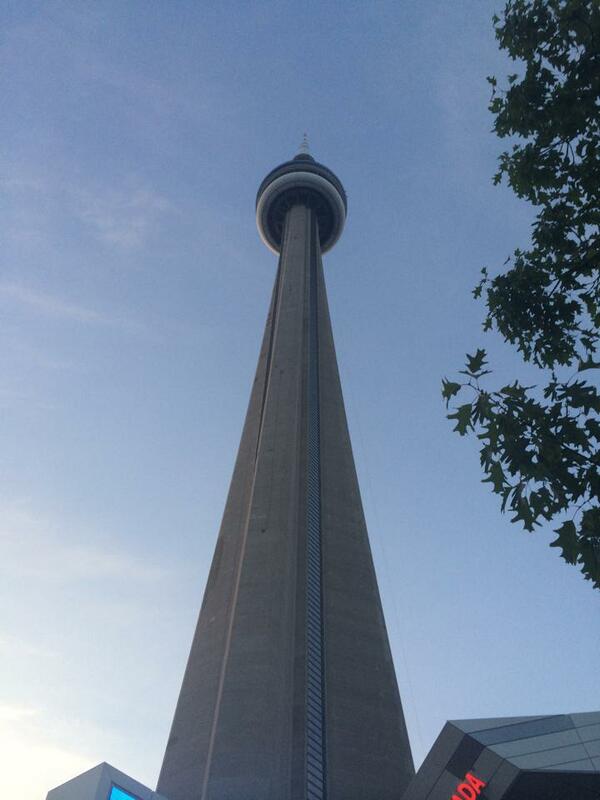 The CN Tower is the world’s tallest tower and until 2010 was the tallest free-standing structure on Earth. We took a glass elevator up to the top of the 1,500-foot, 147-story building at a speed of 15 mph and got out at the restaurant, which makes a full rotation every hour. The sunset view was absolutely breathtaking – we saw everything from the heart of the city to the shores of Lake Ontario. CN Tower, the world’s largest tower, in Toronto. 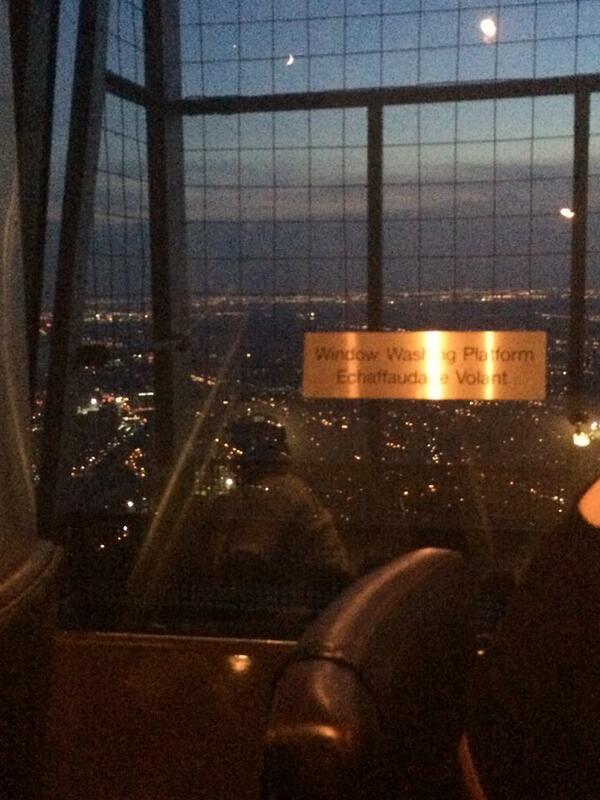 The platform for the window washers atop the CN Tower – no thank you! 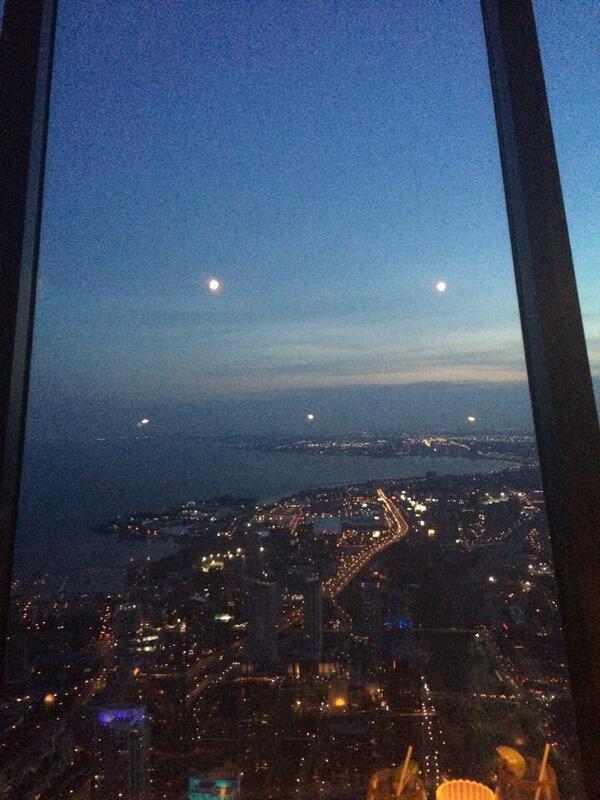 Breathtaking view at 360 Restaurant at the top of the CN Tower in Toronto. 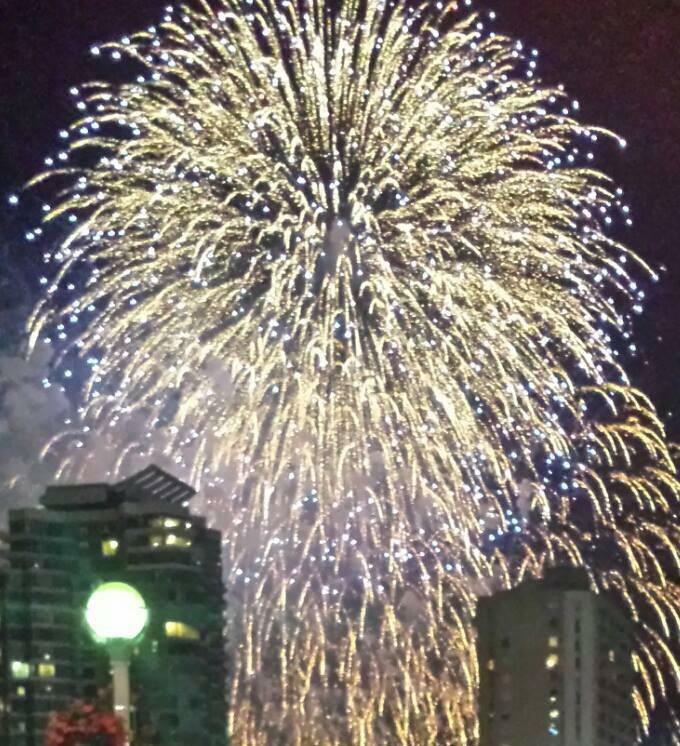 Donald took a photo of the Canada Day fireworks on his phone. On the Canadian side, there are not a lot of signs that direct you to the main visitor center. You exit the main highway and end up on a side road that runs parallel to the border with the U.S. After a 20-minute drive, we finally found the parking lot for the falls. Parking was exorbitant. We only stayed an hour and a half, and it cost us $20. The area surrounding Niagara Falls definitely reminded me of what Gatlinburg, Tenn., has become: touristy airbrush t-shirt stores, candy shops and run-down motels. I understand folks would want to make a vacation out of Niagara Falls, but I couldn’t see myself spending more than a day there. I’ve often heard that the Canadian side of the falls is better, and I can see why. On the American side, it appeared that you were on top of the falls and looking down below at the water. 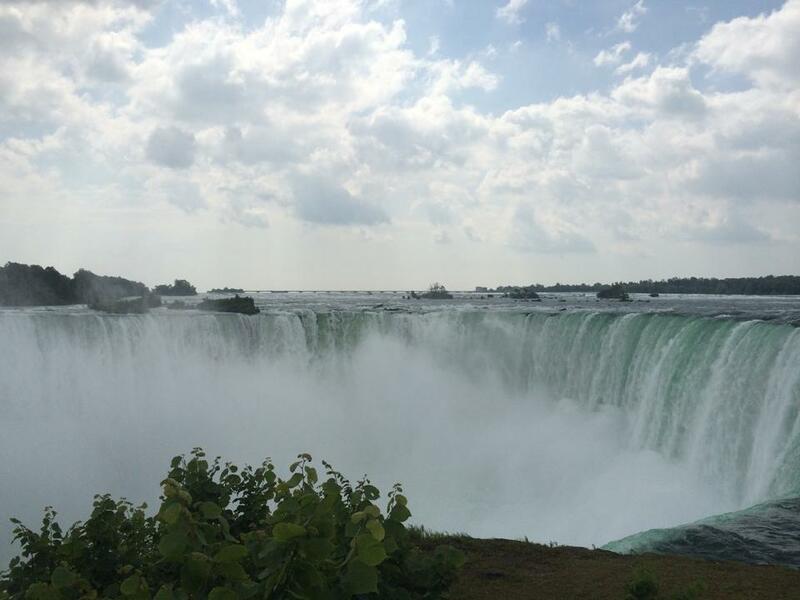 On the Canadian side, you are midway below the falls, so you can see the water rushing down. I’m glad we made our stop on the Canadian side. 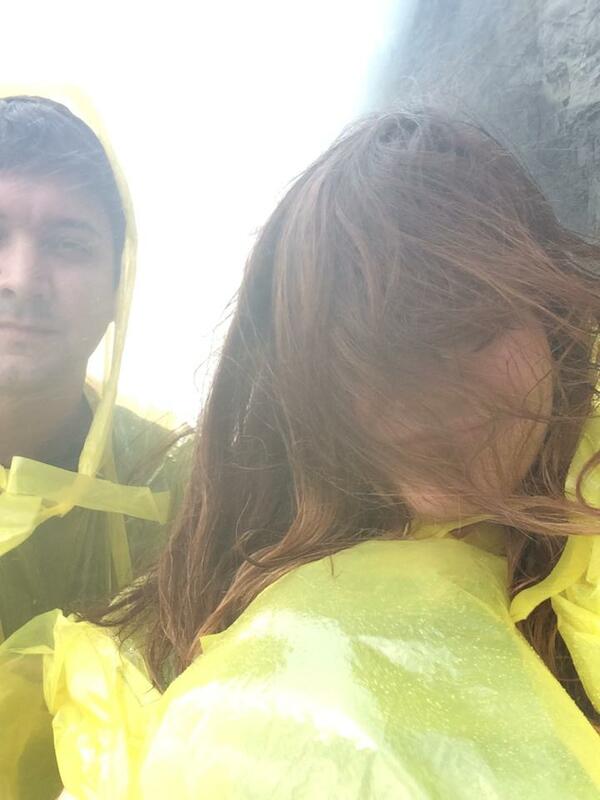 We decided to buy tickets for the “Walk Behind the Falls.” It was a neat experience — even if we did have to wear horrendous yellow ponchos. Unfortunately, the place was packed for Canada Day, so the line was really long and we spent much of our time there underground and inside waiting for our turn to take the elevator into the falls. Still, the visit was well worth it. As a bleeding heart conservative, I was happy to learn that the Canadians don’t use taxpayer money to fund Niagara. Instead, visitors’ ticket prices keep the place up. 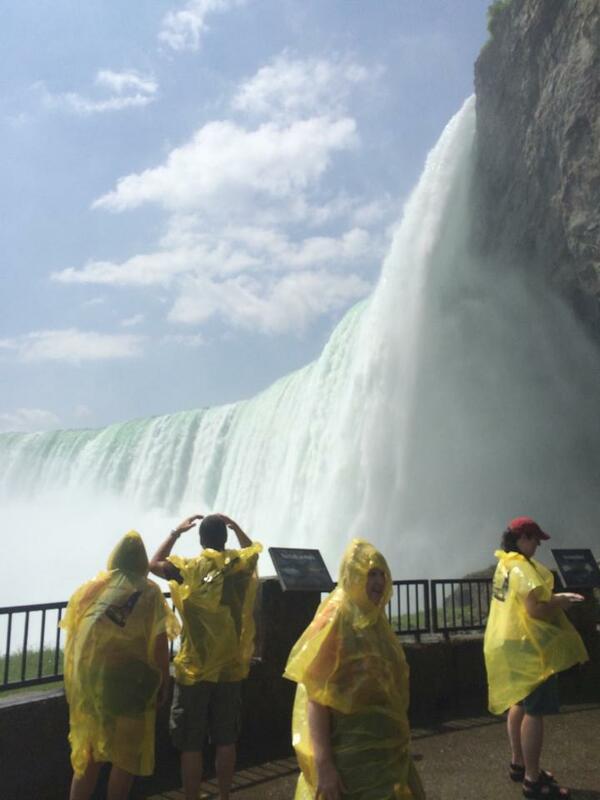 Looking very attractive inside Niagara Falls. Fellow tourists walking underneath Niagara Falls. After our stop at Niagara, we hit the road for Washington. We stopped briefly in rural Pennsylvania to watch the U.S. lose in the knockout round of the World Cup, and we were definitely glad to be back in Washington to recuperate from what was an eventful six days. Our trip to Canada was wonderful. Of all the places we visited, Montreal was, by far, my favorite. I’d like to see Toronto again, too. Canadians were as friendly as their reputation suggests, and we ended up doing a lot without spending a ton of money. Speaking of money, credit cards were accepted virtually everywhere which was great for a gal like me who doesn’t care for carrying cash (note: some places are problematic because American credit cards don’t have chips, but most are OK [even American Express]). Being immersed in a well-preserved Francophone culture was just lovely, and even if our French wasn’t perfect, they obviously appreciated our effort. I look forward to my next trip there — and my next plate of real poutine, too. Update: After Donald checked in at Novotel in Toronto on FourSquare, the social media account manager for the hotel replied to ask if he enjoyed his stay. When he expressed his dissatisfaction, they got in touch with him and then, with me. I spoke on the phone with a very friendly hospitality manager who apologized for our bad experience, blaming a convention of teenagers in town for the noise. She offered to refund half our stay, but because I booked through Hotels.com, which is owned by third party booking site Expedia, she could not. Instead, she offered me half off a future stay and an upgrade to their best room upon my arrival. I’m glad that they attempted to rectify the situation, but I’m disappointed that we weren’t given the refund. This was definitely a reminder of the risks of using a third party booking site — the management of the hotels where you stay may not have the ability to properly address an issue because of how they are paid for your stay.